You are here: Home / Soccer Psychology Tips and Strategies / Soccer Psychology Articles / Are you Conditioning Your Mind to Perform Well? Are you Conditioning Your Mind to Perform Well? What Do Mental Game Coaches Do For Athletes? Is something lacking from your training that is holding you back from your potential? Are you looking to jump start your play on the soccer field? Are you searching for some competitive edge over your competition? In order for you (or your athletes) to play your best, you need to train your best. It isn’t enough to play scrimmages, work a few drills, and condition your body. If you are not conditioning your mind, in conjunction with your physical training, you will not be optimally trained and prepared to play your best. How do you condition your mind? Let’s flip that question and determine how do you get physically stronger? Some soccer players hit the weight room with their strength coach, some players work with conditioning coaches to improve their aerobic capacity and some players train with speed and agility coaches to improve their quickness. 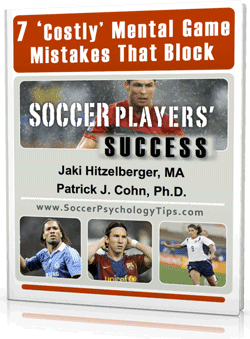 To gain mental toughness, many elite soccer players seek the help of Sport Psychologists and Mental Game Coaches. A vast number of soccer players, both elite and professional, recognize the importance of a stronger mental game and devote a lot of time towards developing mental toughness. Adam Bogdan is a goalkeeper for Liverpool FC goalkeeper. Bogdan knew it was critical to improve his mental toughness so he solicited the help of a Sports Psychologist. Working with a Sport Psychologist helped Bogdan improve his competitive focus by allowing him only to attend to those things he can control in the moment. You should work on all the physical aspects of performance but soccer is also a mental game. If you want to get to the next level, if you want an edge over the opposition, you need to train your mind. Research the importance on mental training. List 3-4 aspects of your game that could improve with mental training. Take some time imagining the difference a strong mental game would have on your play on the field. Download and complete the test. Email your results to us for a quick evaluation.